This is the third post of the tutorial series called Node Hero - in these chapters you can learn how to get started with Node.js and deliver software products using it. What happens in the background? The main thread will be blocked until the file is read, which means that nothing else can be done in the meantime. To solve this problem and utilize your CPU better, you would have to manage threads manually. To resolve this issue, Node.js introduced an asynchronous programming model. Asynchronous I/O is a form of input/output processing that permits other processing to continue before the transmission has finished. In the following example, I will show you a simple file reading process in Node.js - both in a synchronous and asynchronous way, with the intention of show you what can be achieved by avoiding blocking your applications. What did just happen here? We tried to read a file using the synchronous interface of the fs module. It works as expected - the content variable will contain the content of file.md. The problem with this approach is that Node.js will be blocked until the operation is finished - meaning it can do absolutely nothing while the file is being read. Let's see how we can fix it! In the example above we pass in a function to the filter function. This way we can define the filtering logic. This is how callbacks were born: if you pass a function to another function as a parameter, you can call it within the function when you are finished with your job. No need to return values, only calling another function with the values. These so-called error-first callbacks are in the heart of Node.js itself - the core modules are using it as well as most of the modules found on NPM. As you can see once we started to read our file the execution continued, and the application printed end of the file. Our callback was only called once the file read was finished. How is it possible? Meet the event loop. Before diving deeper, let's make sure we understand what event-driven programming is. In practice, it means that applications act on events. 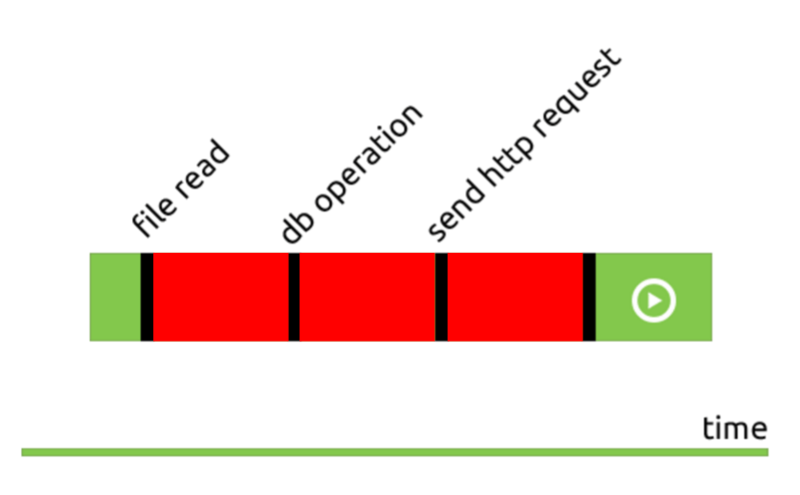 Also, as we have already learned in the first chapter, Node.js is single-threaded - from a developer's point of view. It means that you don't have to deal with threads and synchronizing them, Node.js abstracts this complexity away. Everything except your code is executing in parallel. To avoid the so-called Callback-Hell one thing you can do is to start using async.js. Async.js helps to structure your applications and makes control flow easier. Let’s check a short example of using Async.js, and then rewrite it by using Promises. The Promise object is used for deferred and asynchronous computations. A Promise represents an operation that hasn't completed yet but is expected in the future. Of course, if you use a method that has a Promise interface, then the Promise example can be a lot less in line count as well. In the next chapter, you will learn how to fire up your first Node.js HTTP server - subscribe to our newsletter for updates.